Angled silicone baby bottle 250ml - Pink Breast-feeding bottle can become a time more natural and clear from the first days of life thanks to the first bottle Angled Wellness. 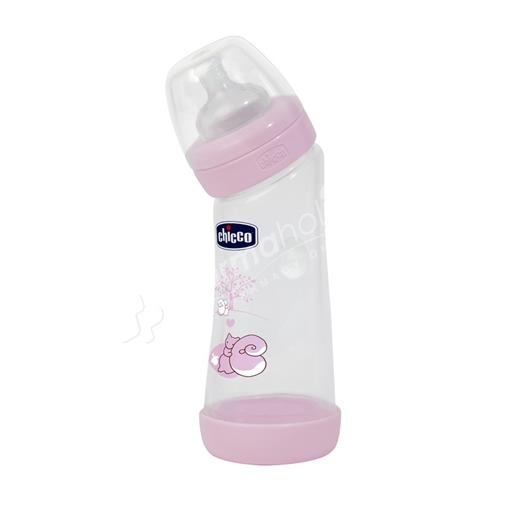 The special angled shape of the bottle allows you to keep the neck of the child in the correct position and the test always full of milk. This, coupled with the Anti-Colic Valve Physiological Teat, allows the baby to swallow less air during feeding, helping to reduce colic. Pink color; 250 ml of silicone.